These are uncategorized, general forex blog posts and articles. They cover general topics about forex trading and the retail forex trading industry. In this article we will define what is a forex signal, and we will describe what types of forex signals providers are available to traders via web searches. We conducted a review of forex signals providers websites with web searches, and discovered various free signals and paid signals along with a wide price range. We will also provide examples of some profitable real time signals that we found. According to Wikipedia, a forex signal is a suggestion for entering a trade on a currency pair, usually at a specific price and time. The signal is generated either by a human analyst or an automated forex system or algorithm. Most signals are real time or live forex signals due to the timely nature of entering trades. We believe that this is a reasonably good definition of a forex trading signal. However, the quality or accuracy of the signals are not considered in the Wikipedia definition, and as you will see this is a huge flaw. A signal should be an indication to trade from some type of human, automated or computer based system monitoring the market conditions. Human based systems are subject to human error, and nearly every one of these systems across the board is terribly flawed and unreliable, due to the basis of the signals being technical indicators, or pairs combined scalping techniques. A forex signal is not an alert, these are two different things. An forex trade alert is simply a notification, like an SMS alert, email alert, economic news driver alert, website alert, audible alert, or visual alert, in real time if possible, due to the timely nature of signals. Alerts delivered to a mobile devices are widely touted by forex signals providers websites, but the signals themselves are of such poor quality that having a speedy method of delivery to a mobile device adds no value. If you find some forex signals you like, free or paid, you must demo trade the signals to make sure they suit your personal taste, schedule, and produce pips and profits. Setting up a forex demo account and testing any signal system is pretty easy, it is imperative to do this because so many of the signal systems we reviewed were of such poor quality, or had no documentation. If you make profits with a signals system, them you can move to micro lot trading, then mini lots. Do not take unnecessary chances, always test the signal system before trading live funds. Based on google search results, forex traders are going to be sorely disappointed when looking for forex signals providers, free or paid, as the overall quality is extremely low. A complete review of forex signals we found is below. When conducting web searches for “forex signals”, most of what we found were not signals at all. We found live trading rooms, trade copiers, web pages and websites with large amounts of advertisements for brokers like click ads, banner ads, and pages with little or no content. Low value websites. A lot of the content on the forex signals providers websites was repetitive computer generated content, outdated facebook pages, “trade ideas”, forex robots advertisements like “set it and forget it”, etc. We did see one prominent top 5 broker with a paid signal service, this service gave alerts for price breakouts and advised selling a pair after it had risen and buying it after it went down on the small time frames, which is an irresponsible way to scalp. Taking signals from a broker would appear to be a conflict of interest as most of these signals encourage frequent trading. Trade signals for swing or position trading was nearly non existent. We can say the bar has been set really low for forex signals providers and you could argue that almost no real signal services even exist. The paid forex signals providers we found in the google searches ranges from $40 – $200 per month, some provide signals for as few as 3 pairs. None of these paid signal services provided enough information on their website to figure out how the signals were actually generated. So determining if they are good quality, profitable signals was nearly impossible, and there is no way to verify if the signals are effective. Traders should ask a lot of questions and testing these signals providers with a demo account would be imperative. Some the paid services require that you open a trading account with them, implying that brokers or introducing brokers are behind the signals, and giving away poor quality signals is a front to get you to open a trading account to churn frequent trades. When you do find free or paid forex signals providers via web searches, here are some of the problems you will encounter: Generally, there will be no explanation of how signals are generated or any type of written documentation to describe logic behind the signals. You will be dealing with a total black box signal system, with no examples provided. Everything you need to understand the signals and how they work is simply not provided. Based on the signals we saw in google searches, we suspect that the signals systems we found are based on technical indicators, or some kind of front for brokers or introducing brokers (IBs), where you must open a brokerage account to “qualify” to get the signals. Remember that any signals based on technical indicators, pairs, or forex robots disguised as signals, or any human generated signals are just standard technical indicators and pairs, all of which have been proven to be ineffective, except for scalping a few pips here and there. We noticed a large number of daily forex signals providers websites that listed the pair, stop loss, and take profit, but the take profit numbers were always very close, like 20-25 pips away. Since the target prices are so close we would qualify this as scalping, and in many cases an unfavorable money management ratio, where the number of pips you are trying to make is roughly equal to the number of pips you risk. This will only benefit your broker in the long run because the money management ratio is barely 1.5:1. We did not see any signals with “hold” recommendations based on long term trends, only where to exit or take profit repeatedly. Because these signal systems are mostly black box systems with no explanation of how the signals are generated, we have to conclude that these signals are based on commonly available technical indicators, and most signal services/websites are for 3-12 pairs. We also have to conclude that brokers and IBs behind many of these websites because of the scalping and take profit levels, and excessive broker advertisements to sign up for trading accounts. These issues are for all forex signals providers websites we found including free or paid. Many of the daily forex signals providers services advertise email and SMS delivery of the signals, “get our signals on the go”. These websites have large pictures phones and Ipads on their websites, but remember these are not signals this is an alert method. Having signals sent to a smart device is great, but is of no advantage or detrimental to your trading success when the signals are worthless. Good forex signals providers should be visual in nature, and easy for a trader to interpret, we found few, if any visual signals that were easy to understand, except for some of the ones mentioned below. Also we found little or no mention of audio signals, which can be easily delivered, like desktop price alerts to tell you a price breakout is occurring. Are Profitable Forex Trading Signals Possible? Yes, they are possible, but even if you find some profitable forex signals providers, you still must set up demo account and do some level of demo trading before proceeding to small amounts of real money like micro lots, then mini-lots. Make sure you understand what the signals mean and how they are supposed to be traded. Since most signals websites have so little documentation about how the signals are generated, it is a must. Forexearlywarning has a combination system of signals and alerts, combined with trading plans. Our signals and alerts are the best in the business and all of the problems we found with other signals and signal services we reviewed have been eliminated. We provide trend signals and live entry signals, which are both visual signals, and a large number of examples to demonstrate the signals, these signals are easy to understand for all traders, even beginners. Along with the signals we provide trading plans for 28 pairs, real time price alerts, which are audio signals to notify you of support and resistance price breakouts, and known economic calendar alerts based on specific times. We also provide live currency trading alerts for notifying you when individual currencies are moving. Since the trend signals are based on the larger time frames, our “take profit” areas might be hundreds of pips away form the entry price, not 20 or 25 pips away like the other signals we reviewed, as we discourage scalping and frequent trading. We believe this is the only trend based signal system available on the web. We trade less frequently and are looking for substantially more pips per trade. We also trade 28 pairs which is the most pairs in the signals business. Our signals and alerts will produce profitable trading, and likely the most pips of any signals system available worldwide. But we still strongly encourage demo trading our signal system, then graduating to micro lots, then mini lots. Our signals system is fully documented and the documentation is thorough and free on our website in the form of 35 forex lessons. The Forexearlywarning website has no broker or IB sponsorship, and our website has no advertisements, nor do you have to open a brokerage account through us. One way to get trading signals that are profitable is to focus on the trends of the market and individual currencies, versus pairs. If all of the EUR pairs are trending down on the larger time frames, the market is signaling for you to sell the EUR pairs. These are “trend signals”. 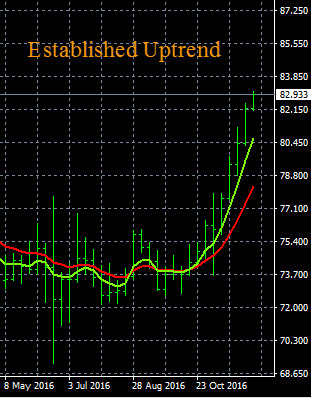 These simple forex trend indicators can be set up on any trading platform, even by beginners. In the example above the EUR/NZD is trending down on the larger time frames. If all of the EUR pairs like the EUR/USD and EUR/JPY are also trending down the market is signaling you to sell the EUR pairs. If half of the EUR pairs are trending down and half of the EUR pairs are trending up, then you would need further analysis of the market based on parallel and inverse groups of pairs. Another signaling system that is profitable is The Forex Heatmap®, which is based on parallel and inverse groups of pairs. The heatmap signals software gives live signals for 28 pairs and is profitable. The are live forex signals and are generated by large amounts of real time forex data, “big data”. 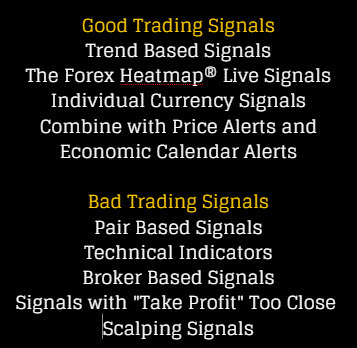 These are the most accurate signals available to forex traders, but they are easy to interpret. If the EUR pairs are all trending down and the heatmap gives you a live signal like this one, you can sell the EUR/USD or EUR/NZD and you have somewhat of a risk free or very low risk signaling system, while also trading in the direction of the trend, so no scalping or “take profit levels” 25 pips away. Here is another example of these accurate, web based signals. In this case the NZD is strong so it would still be okay to safely sell the EUR/NZD, or possibly trade another NZD pair that is trending pair with good pip potential. Here are more live signals from the heatmap signals software. This page reviews some forex trading signals based on the heatmap, and many more examples of profitable trading signals on our high quality forex trading blog. Some of the important points of the results of our signals investigation can be summarized in the info graphic below. Conclusions – Trying to locate profitable forex signals providers is difficult via web searches, but not impossible. We conducted a forex signals providers review and searches on the web and found that most of the information about signals is not really about trading signals at all. Signals websites are loaded with broker advertisements or sponsored by brokers or IBs that encourage scalping and frequent trading. If you find a signal system you like, email the signals provider and ask a lot of questions. Get examples of the signals to make sure you do not waste time, or even worse lose money with live trades. Always test the signal providers with a forex demo trading account. Forexearlywarning invites you to try our trend based trading plans, multiple types of visual and audible alert systems, and live trading signals package, which we believe is the best trading system in the retail forex trading industry. In this article we will review and compare forex news calendar features that are available to traders. We will review what features and functionalities are best to have when selecting the best news calendar to meet traders needs. A forex news calendar is an important tool for forex traders. If you combine a good quality news calendar with other tools listed below, a trader can be on the road to successfully trading forex news drivers. Traders will always be in front of the computer when news is potentially creating volatility and price movement. Some features in a forex news calendar are important to have, others we do not believe are needed. Probably the most important news calendar feature is the interface. If an news calendar is easy to read, with well spaced text, and easy to read controls, The end user experience will be positive. News events should have color coding for better visibility. Most forex news calendars have a set of controls for customizing the news calendar features. With most calendars, traders can add or remove currencies that they want to see scheduled news drivers for. For example, if a traders does not trade the Mexican Peso, you can just remove it from the calendar using the controls. We suggest setting up the news calendar for reporting scheduled news drivers for the 8 major, most liquid currencies: US Dollar, Canadian Dollar, Euro, Swiss Franc, British Pound, Japanese Yen, Australian Dollar, New Zealand Dollar. These 8 currencies combine into 28 different pairs, and these are the pairs we track with the Forexearlywarning trading system. Another calendar control or filter would be to set up the news calendar for the most volatile news drivers only. This way the calendar is more compact. Most forex news calendars also come with adjustable clocks. Users can set the calendar clocks to local time or the GMT time clock, whatever the end user prefers. Make sure the news calendar you choose has a look ahead calendar for planning your trading week. Click on the “this week” to see the entire week of important news drivers on one screen. This helps with planning your trading schedule if you are on a tight schedule. You can also use the look ahead schedule to see when major bank holidays are. USA bank holidays are good days to take a day off from trading or take a long weekend. Every trader needs an occasional mental break. Make sure the news calendar you are using is on a website that is fast and the pages load quickly on your laptop or any mobile device like Android or Ios device. Many news calendars have a lot of popup advertisements that make the pages load very slowly. Choose a new calendar with little or no advertisements on the page to improve speed. Some news calendars have alert systems news alerts, alarms, and or apps. These features are fine but not necessary because you will always know when the important news drivers are in advance. Traders can also use other forex alert systems with the news calendar to know when the market is moving on any pair. A forex news calendar will pinpoint exact times to be in front of the computer in local time or GMT time clock. With this knowledge a trader can be in frot of the computer at the proper time for a potential trade and market volatility. To complete your tool set for trading, you would need a forex trading demo account, an entry management confirmation system like The Forex Heatmap®, and a a set of simple and easy to set up trend indicators. You can find all of these trading tools on the Forexearlywarning website and a demo trading account is available from any forex broker. With this tool set you are ready to start demo trading, almost immediately. After any scheduled news driver on the 8 currencies we follow, you can check for consistent strength or weakness in one currency, then if the movement is in the direction of the major trends on the higher time frames, you can enter a demo trade. The selection process is simple. Just do a google search for “forex news calendars”. Some popular calendars will appear on the first two pages of search results. Dailyfx, Babypips, Forexlive, etc. all have news calendars to review. Forexearlywarning also has a great world economic calendar on our website, along with the other tools like trend indicators, price breakout alerts, and The Forex Heatmap®, for trade entry management. The documentation how to use these tools is also on our website. After reviewing some calendar options pick one you like that has the features you need. Conclusions about forex news calendar selection: After you select the best news calendar for your needs, you will have an important piece of your forex trading system. Then continue building your trading system and test the system with demo trading. Then the final step is trading profitably with real money, micro lots and mini lots. Today the Bank of England base rate remained unchanged. The Monetary Policy Committee voted 8-1 to keep interest rates unchanged. The announcement came today at 1200 GMT. The Monetary Policy Committee (MPC) also signaled that interest rates would remain low and steady. The central bank also lowered its economic growth forecasts. The Bank Of England Base Rate news today caused the British Pound (GBP) to sell off, and this news impacted forex traders. The GBP/NZD sold off, due to some NZD (New Zealand Dollar) strength in the market. The GBP/NZD is hitting session lows at 2.2950, the overall sell off was nearly 400 pips, which is a very strong intraday selloff. The GBP also dropped against the USD, and this pair is down to session lows of 1.5120. 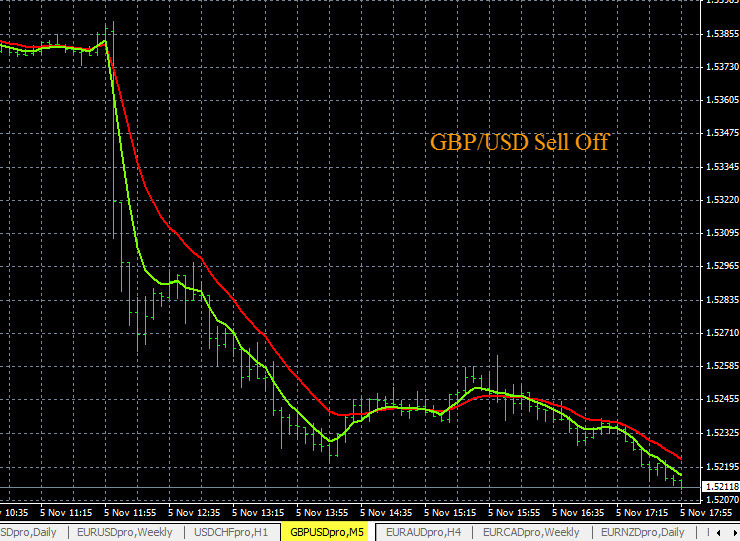 You can see the strong selloff on the GBP/USD on the chart below. Traders could have profited nicely after today’s news. Both sell trades on these two pairs look like short term/intraday sells, we expect the GBP/NZD to reverse back up based on the larger trends in the market. This pairs sold off but it is not trending down on the larger time frames. The GBP/USD also sold off, but this pair is still ranging up and down, so we would scale out lots or exit completely on any short term/intraday trades. The trading system you see above is The Forex Heatmap®, which provides live buy and sell signals for the GBP pairs and 7 other currencies, and 28 pairs total. The Bank of England Base Rate news, or interest rate news on any currency is one of the main forex market fundamentals for analyzing any currency, that drive currency movement and trends. Forex news is part of any great trading system. Today the Chinese Yuan devaluation created strong movement and trading opportunities for forex traders. The Chinese Yuan (CNY) was allowed to appreciate 2% against the US Dollar (USD). The People’s Bank of China made this move due to the recent economic slowdown there, but was still very sudden and unexpected. This was the biggest one day drop in the value of the Yuan in 20 years. Chinese Yuan devaluation against the US Dollar by 2% is hoped to boost the Chinese economy. This devaluation caused a strong reaction in the forex market. Currencies in the Asian region and currencies of Chinese trading partners were affected by the devaluation. The Japanese Yen (JPY), the Australian Dollar (AUD), and the New Zealand Dollar (NZD) were all affected by today’s devaluation. Most of the price movement and opportunities for forex traders today resulting from the Chinese Yuan devaluation were on these three currencies. The AUD and NZD both tumbled on the Chinese Yuan devaluation news, but the Euro (EUR) also strengthened. This produced strong movements in the EUR/AUD and EUR/NZD pairs. The EUR/CAD also moved up strong as all commodity based currencies reacted to the devaluation news. The impact of the devaluation news can produce intraday or trend based trading profits for forex traders. As you can see below, the trading opportunities on the AUD pairs alone was significant. 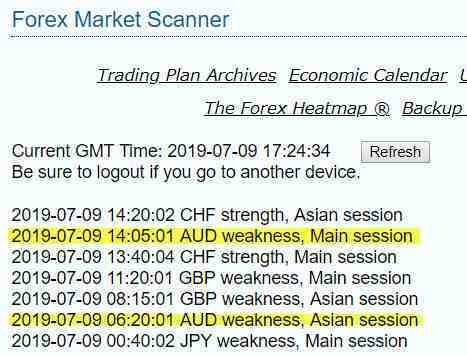 The live indicators shown below, The Forex Heatmap® indicated buy signals on the EUR/AUD, EUR/NZD and EUR/CAD for intra-day or potential longer term buys. All three of these pairs are currently in up trends. This is a valuable lesson on how scheduled or unscheduled forex news and global events can bring profits to any trader. Using this type of real time signal system is highly beneficial. The movements shown are significant intraday price movements. A 1.17 percent movement in the AUD/USD is about 80 pips, and a 0.93% movement in the EUR/AUD is about 150 pips. Since the EUR/AUD is trending up on the higher time frames, traders can use the Chinese Yuan Devaluation news as and entry point into the trend. Traders can also move their stops to break even, thus preserving their upside potential for even more pips. All traders should consider using The Forex Heatmap® in their trading tool set, along with some simple forex trend indicators. It is important to remember that government interventions and devaluations have been tried many times in the past with various currencies. These devaluations and short term price fluctuations are artificial, and usually short term, due to the high liquidity of currency markets. The overall market forces like the larger time frame trends and interest rate direction will always be the strongest guide for the direction of currencies like the Chinese Yuan. Forex news trading is possible for any trader as long as you have the correct tools and indicators. We will show traders how to locate the most important forex news, then give them the proper tools and an indicator set for a complete forex news trading strategy. The exact times of scheduled news releases can be obtained from any forex news calendar. Here is a snapshot of a popular news calendar. Traders can see the news items with their exact release time, and the times can be adjusted to GMT time clock or local time. Forex news calendars like this one and the news calendar on our website are part of your tool set for news trading for locating high impact forex trading news. High impact news items are in red on this particular news calendar. A good set of trend indicators and a live signaling system are also part of a great forex news trading system. After the news there can be volatility in the market for the any of pairs with the news related currency, or possibly on other pairs too. Before doing any forex news trading, traders need to know the direction of the major trends of the market, and you also need to know if at least one currency is consistently strong or weak before entering any news related trades. Knowing the direction of the major trends and having some simple forex trend indicators is a good place to start with your indicator set. Here is a set of free forex trend indicators that can be set up on most forex charting platforms. When you place a forex news trade you will know if you are trading in the direction of the major trends. Another powerful tool for your news trading would be The Forex Heatmap®, which is a real time momentum indicator for forex traders. This would be another great indicator to have ready for trading forex news. It works for 8 currencies. If you enter a trade after some important forex news, always place a stop order to minimize any risk of loss. When the trade proceeds in the direction of the indicators and the trend, then scale out lots and move your stop to break even. Scaling out lots means you take profits on half of your lots and let the remaining lots continue to profit, with a break even stop on the remaining lots. Capturing profits from forex news trading and moving stops will increase your account balance and reduce risk to zero. Let’s look at one forex news trading example. The forex news calendar indicates an important Canadian Dollar (CAD) news driver at 1230 GMT in the main trading session. The news happens and the CAD is consistently weak on all 7 pairs in the group in one direction using The Forex Heatmap®. 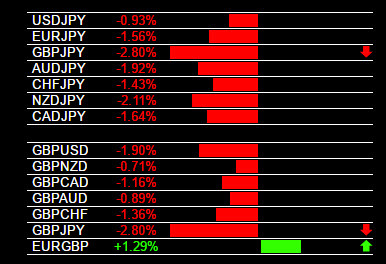 The heatmap specifies that the NZD/CAD has the best signal. You check your trend indicators and you see that the NZD/CAD is in an uptrend on the higher time frames, with no nearby resistance. 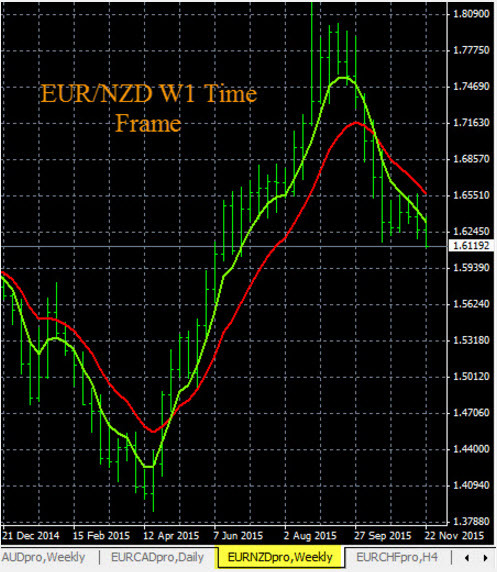 In this case you have a very good situation for buying the NZD/CAD, or selling the CAD/CHF. With signals this strong a trader can enter a trade in the direction of the trend, and in many cases enter a short term term trade on the smaller time frames in the direction of the CAD weakness. Signals this strong and consistent generate great movement. Conclusions About Forex News Trading – Trading after forex news drivers is possible with the right set of tools, indicators, and money management techniques. The techniques and tools presented here work well for the 8 currency groups and 28 pairs we track daily as part of our trading system. A profitable forex strategy that leads to successful trading is possible for any forex trader, using the guidelines shown in this article. Trading the forex market profitably can be accomplished by knowing what time of day to trade, having a set of accurate signals that are easy to interpret, and reading the trading signals correctly. Determining if the market is trending or ranging is also beneficial. Follow the guidelines and steps listed below to ensure that you have a profitable forex strategy that leads to much better trader. The best time to trade the currency market is in a 4 to 5 window of time just before the opening of the New York Stock Exchange. This is when forex trading activity is highest and you see strongest movement cycles. The currency pairs have longer movement cycles during this time. We refer to this as the main session. It is also possible to trade in the Asian session using the techniques in this article, but you should wait until you have one year experience before attempting to do this, due to lower volatility and shorter movement cycles. Executing trades in the Asian session in addition to the main session will naturally give you more pips and more profitable forex trading, especially if you trade many pairs. If you read your trading signals properly you can enter buys or sells in the main session and start to bring pips into your account. This is true for intra-day trades, or trade entries into the existing trends. One of the best signaling systems available is The Forex Heatmap®. Most forex traders only trade the EUR/USD. If a trader wants to buy the EUR/USD you can look for EUR strength across the board on the heatmap, like the example below, a strong 1.71% movement on this day. Most EUR/USD traders really need a signaling system like this. The good news is that the heatmap works to provide buy and sell signals on 28 pairs, not just the EUR/USD. So naturally your high quality trade opportunities and profits trading the forex market will increase quite a bit with a signaling system like this, due to having many more trading opportunities. Trading in the direction of the major trends of the forex market will always be part of any profitable forex strategy, and naturally make successful forex trading a reality. All you have to have is a simple set of exponential moving averages to check the trends, then focus your trades in the direction of the higher time frames, H4 and larger. This way if you enter a trade and are going in the direction of the trend, you have a chance for additional profits tomorrow and the day after that as the trend continues. When the forex market is not trending, it is ranging. Ranging pairs are pairs that are cycling up and down inside of support and resistance. If you would like to trade pairs that are ranging, just make sure that they are ranging up and down in at least a 100 pip range so your money management and risk/reward ratio is solid. All trades carry risk so the potential reward must be fairly large. You can check the moving averages for the amounts of the ranges. Make sure the pairs you range trade are ranging on the H1 time frame or larger. Another component of a profitable forex strategy would be to know when the news drivers are, related to the pair you are trading. For example if you are trading the USD/JPY you would want to know when all of the strong economic news drivers were scheduled for the USD or JPY currencies. There are many economic news calendars available on the web, here is a handy world economic news calendar we like on our website. It shows the news drivers for all eight currencies we trade, along with other currencies too. Before entering any forex trades, forex traders should also know the risk to reward ratio of every trade they enter. This ratio can be calculated in advance so you can decide yes or no well ahead of seeing any buy or sell signals for that pair. Example: A trader is considering buying the AUD/USD, when it breaks the short term resistance, the next resistance major is 120 pips away form the breakout point. If you buy the pair and open the trade with a 30 pips stop, then 125/30 is 4 to 1 positive money management ratio. This is a great ratio because even with only 50% accuracy you can grow your trading account at a very high rate with ratios like this. You risk 30 pips with 120 pips of profit potential. Having a forex currency strength indicator would be an important part of any accurate trade entry system. Forex traders need accurate tools for entering trades. If you combine accurate tools for trade entry with setting and moving stops you are close to creating a profitable trading system. Look at the example forex strength indicator below. This is called The Forex Heatmap®. 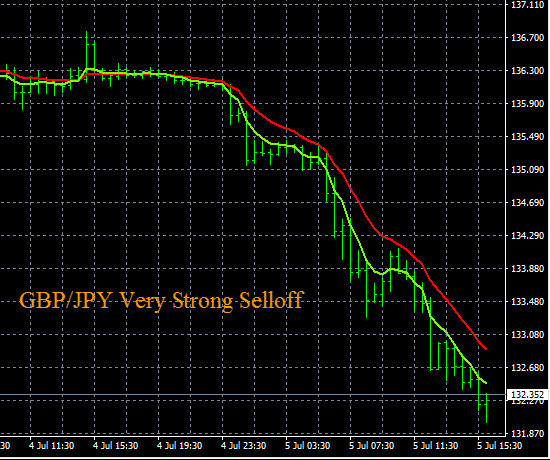 It is a forex currency strength indicator for 28 pairs. This is an example from daily trading in the main session. In this example EUR/JPY had a clear sell signal along with several other JPY pairs. The Japanese Yen (JPY) was strong on all pairs and the EUR (Euro) was weak across the board. This drove the EUR/JPY strongly lower. The EUR/JPY had a valid sell signal in this trading session. Since this pair was also trending down on the larger time frames, not only could a trader have had a successful trade entry, but this pair also has ongoing pip potential due to the trend on the larger time frames. A forex currency strength indicator like The Forex Heatmap® can give you a good trade entry, but if you are trading in the direction of the major trends, there will be additional upside potential to make more pips. This great indicator works for 28 currency pairs and the signals are live in the main trading session, and also the Asian trading session. Pips are possible in both trading sessions. In this example, the NZD (New Zealand Dollar) is showing consistent strength in the main trading session on the heatmap. 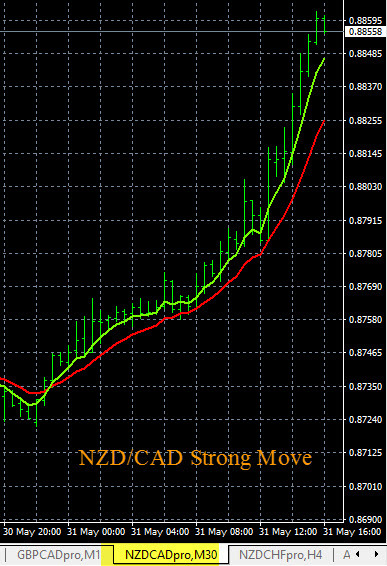 This NZD strength, combined with a small amount of CAD (Canadian Dollar) weakness, drove the NZD/CAD strongly higher on this day, a very large movement for such a low volatility pair. Here are the live signals and associated price movement. Once again this movement is excellent and the signals are solid, indicating NZD strength. In this case, The Forex Heatmap®, the forex currency strength indicator for trade verification, worked great to give you a signals for a strong and profitable trade entry. In this article we have only shown two examples, but this system works daily in both trading sessions for 8 currency groups and 28 pairs. You can trade all of the USD, EUR, CHF pairs, etc. with this great system. We have a complete library of example trading signals you can check for all of the pairs we follow. Forexearlywarning has a real time forex scanner that uses currency strength to screen 28 pairs for live entry signals. It also has a built-in alert system that is visible on the web and mobile devices. This forex scanner system requires no programming and is ready use when you login to our website. Most forex traders trade the same pairs over and over, scalping on the smaller time frames. If a trader could have a tool like a forex scanner to scan 28 currency pairs and point them to the best opportunities in the market, the success rate would rise, they would use this tool daily and have a chance to make substantially more pips. We have seen several forex market scanners or market analyzers and we believe that this is the best forex scanner available. This is because this scanner is based on parallel and inverse analysis and currency strength trading principles. Our forex scanner software is built-in to our website, and runs all of the time during forex market hours. It also has fully redundant backup systems, so there is absolutely no programming needed by the end user, just plug and play. Our forex scanner is called The Forex Heatmap®. It works for 8 currencies and 28 pairs total. Here is one example trade based on a scan of the CAD pairs. The scanner sees that the CAD (Canadian Dollar) is weak on all pairs. Because the CAD is weak, it points you to the USD/CAD for a buy or the CAD/JPY for a sell. It works the same way for a total of 8 currencies and 28 pairs which are most actively traded and most liquid. This forex screener/analyzer software has a simple display and user interface, and price movement creates the scanner signals. Because of the CAD weakness, the CAD/JPY sells off in the main session around 120 pips. This type of movement allows traders to enter the trade, set stops to break even and continue to monitor the trade if you are trading in the direction of the major trends on this pair. Traders can also scale out profitable lots. Along with a real time forex scanner, traders need a simple set of trend indicators, so they can know the direction of the major trends on the pair they are considering trading. Traders would also need one or more alert systems to complete their trading system. We offer all of these tools at Forexearlywarning, along with the heatmap scanner. If you are a forex trader and are looking for a real time forex market scanner that gives accurate trading signals for 28 pairs, the heatmap should work well for most traders. Precision trading and real time scanning of the forex market is now possible. A forex trading system that works and is effective at making pips on a consistent basis is actually quite elusive. Forex traders struggle, sometime for years, and never see or come into contact with a complete trading system. These traders don’t know what a complete trading system even looks like. We only know of one complete trading system. In this article we will explain what the components are of a complete forex trading system. Plus, we will show you one trading system that is complete and ready to use. A complete forex trading system should have all of these components: The system should work on any pair. If you trade only one pair like the EUR/USD it should work the same way for this pair, or any other pair. The system should be able to accurately analyze any pair, any individual currency or the whole forex market. The system should be effective in trending or ranging markets. Specific and accurate entry point criteria and written rules for trade entries should be provided. Options for managing live trades, money management, and stops should be provided for the life cycle of any trade. How many trading systems have you seen that have all of this included ? We only know of one. Many forex traders have a few standard technical indicators on their screen and the call it a trading system. These are not trading systems at all. If you are searching the web for a good forex trading system, you will be very disappointed. If you do find a system that you like, make sure it has all of the components listed above, otherwise the system is incomplete. One possibility is to design your own trading system. With the proper knowledge you can do this, it will be a lengthy process but it can work. Another option is to take an existing system and use it right off of the shelf. If a trader does find a forex trading system they like, they should make sure that all of the details and documentation of the trading system are provided, so they can be reviewed by the end user. This would include any manual trading system or any automated system. Also the cost of the system should be known. We believe the Forexearlywarning trading system is a system that works well for most end users. It works for 28 pairs and the documentation is full and complete for anyone to see the logic and details. The trading system is a trend based system, using the higher time frames and simple trend indicators. The system points you to the correct pair to trade with our entry management system, The Forex Heatmap®, and an example signal is shown below for the AUD (Australian Dollar) pairs. Money management procedures for setting and moving stops are spelled out clearly. Traders can easily compare this forex trading system to any other system, or any indicator set. We cannot find any trading systems that come close in quality and we cannot find any complete trading systems at all besides this one when searching the web. The system uses proven techniques like multiple time frame analysis and parallel and inverse analysis. We prepare daily trading plans and show traders how prepare plans on their own. We set audible price alerts and also set price targets based on support and resistance levels. This is a complete trading system, with all system documentation on our website. One of the most difficult part of forex trading is knowing what pair to trade and when. Our simple trade entry management system, The Forex Heatmap®, is shown below for the AUD pairs. 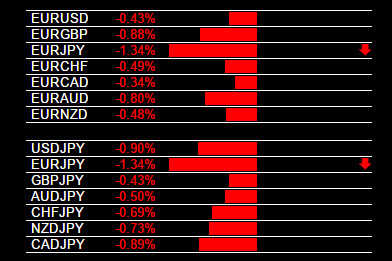 Based on AUD strength the heatmap says to buy the AUD/USD or the AUD/JPY. Having this as part of the overall trading system allows much better money management. If the AUD/USD is also in an uptrend, even more pips are possible. If you find a great forex trading system, or one you like a lot that is logical and easy to work with, the task of becoming a successful traders has just started. You must study the system documentation well, demo trade the system for a while to see if it suits your schedule, expectations, etc. If you cannot make any pips doing this then the system is of limited value or no value to you, even though the system itself works well. If you locate a forex trading system you like, make sure the system works for you.